On Monday night, March 19, at the Agricenter in East Memphis, about 150 people turned out to learn how to be volunteer storm spotters for the National Weather Service. Following the two-hour training session, during which NWS personnel described what to look for in a severe storm and how to report it back to the NWS office, MemphisWeather.net meteorologist Erik Proseus invited those who had Twitter accounts to stay for a "bonus" training session on the brand-new #mSpotter storm reporting program. About 40 individuals listened as Erik described how social media can be used to further the mission of the NWS, that is to "protect life and property." While conventional methods of submitting storm reports to the NWS consist primarily of a phone call to the local office or submitting the report via a web form, #mSpotter allows those with Twitter accounts to send in their reports using their social media accounts. The new program was designed to mirror a similar program (#tSpotter) in middle TN that has been highly-successful in the few months since it commenced under the oversight of Nashville attorney David Drobny, himself an avid weather enthusiast. The program works by having a "middle man" - in the case of #mSpotter that role is filled by MemphisWeather.net - monitor incoming storm reports from the Twitter-sphere around Memphis that are tagged with the #mSpotter hashtag and then pass them on to NWS-Memphis via a chat function utilized by all NWS offices across the country. #mSpotter encourages reports that are geo-tagged by the submitter's smartphone to allow for exact location information, as well as a picture of the event (i.e., hail, wind damage, flooding). This allows the "tweeted report" to contain exact information on the location and type of severe event that sometimes can be subjective or unclear (for instance an intersection that is not well-known). #mSpotter reports will use primarily the same severe weather reporting criteria as traditional storm reporting: tornado/funnel clouds, 1/2" of larger hail, 50 mph wind or stronger, very heavy rain or flooding, weather-related structural damage, downed trees or power lines, and winter precipitation. In addition to the type of event, location, and time, as well as a geo-tag and picture if available, tweets should include the #mSpotter hashtag so that they are easily retrieved by MWN and can be relayed quickly to the NWS. The goal of #mSpotter is to provide the National Weather Service with reliable reports of severe weather more quickly than conventional means, thereby allowing meteorologists to more efficiently and quickly warn those ahead of the storm what severe weather threats the storm contains. Anyone with a Twitter account in the 8-county Memphis metro area is welcome to submit storm reports via #mSpotter. 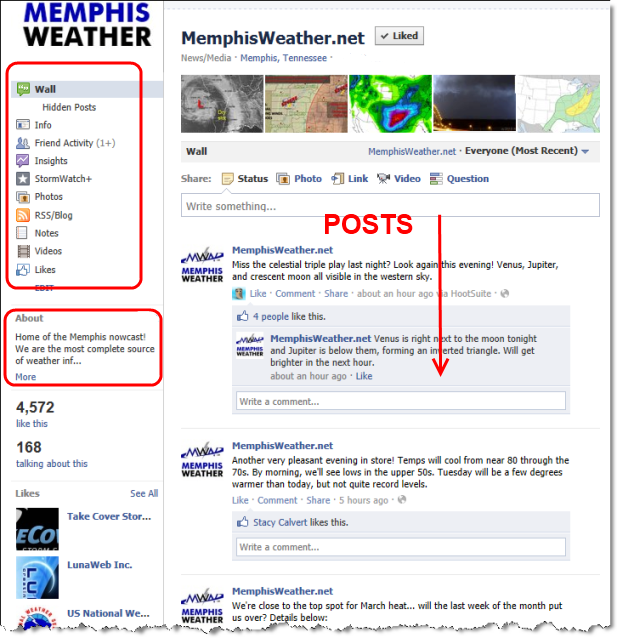 We encourage you to read over the #mSpotter page on MemphisWeather.net prior to submitting any reports so that you are comfortable with how and what to send. Thanks for being a part of this community-based public service! Well, Facebook has done it again! As you've no doubt seen, many individuals have begun using the new "Timeline" format that Facebook has developed. Now the Timeline has come to all Fan and Business pages. All fan pages will transition by this Friday, so you'll see many more in the days ahead (we held off as long as we could!). We hope to provide you with the information needed in this post to successfully navigate the new MWN Facebook fan page, including some of the pros and cons. We'll start with screen shots of the old and new versions of the page. To access our live Facebook page, in the new format, click the link above. The big changes are highlighted in red, while new items are in purple on the Timeline (Figure B). First of all, if you are looking for any of the information, or "landing tabs" as they were called, that were in the left column, you will now find those below the brand-new Cover Photo. These are now referred to as "apps." On our Timeline, you'll see "Photos" (which we cannot move), "Videos," "StormWatch+," and "Likes." Click on the drop down arrow/number next to the Likes button for additional apps that we may provide. Except for Photos, we can change the order of any of these or add new apps. The About section, which in the old format was very limited, has been expanded to show additional verbiage and appears next to the apps section below the cover photo. Most importantly, posts by MWN to our Wall, which previously appeared in one main column down the body of the page, will start off in the left-hand column of the new Timeline format. At the top of the right-hand column will be things like what others are saying about MWN, our page's likes, etc. Then, below these items, our posts will take on a 2-column format, as in the screenshot below after scrolling down the page. 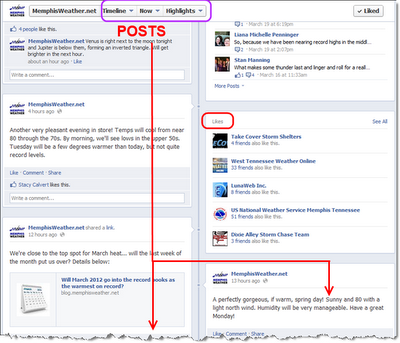 Figure C. After scrolling down MWN's new Facebook "Timeline"
We have the ability to "highlight" certain posts (which means they cross both columns) or even pin them to the top of the Timeline, as shown by the yellow bookmark icon (circled in purple) in Figure B above. You can navigate through our apps or go back in our timeline by month using the drop-down menu bar that appears at the top of the page after scrolling down past these features that are at the top of our new page (see purple circled area in Figure C). While it will take some adjustment, there are a couple of new features that we think you will like (and I know we will). One is the ability to pin a post to the top of the Timeline. We can see using that for an important story, a bit of information that you need to know, or perhaps to let you know we are in nowcasting mode during severe weather. We have complete control over what appears at the top of the Timeline, which keeps you from having to dig back through multiple posts to find it. Secondly, you'll see a "Message" button below the cover photo. This is a brand new feature to Facebook Fan Pages. Previously, in order to contact us, you had to write on our Wall and hope we saw it. Now, with "Message," you can use the Facebook Message system to wrote directly to us, just like e-mail. We can respond through Messages and the reply will appear in your normal Facebook Message stream, just like with personal Facebook messages you send. We encourage you to use that for questions or comments that may not be appropriate for a wide audience. If you want to write on our wall with a weather question that others may also be interested in, feel free! If you want to ask us a more direct one-on-one question, use Messages. The last item to address is our severe weather nowcasting service. WE WILL CONTINUE TO NOWCAST DURING SEVERE WEATHER ON FACEBOOK. However... we expect that if you load our Facebook fan page and click refresh periodically, the new "Timeline" format may be harder to follow than the old (even though it should work well given it's name...). We honestly don't know exactly how it will work. If you simply follow your News Feed on Facebook, especially if you order your posts by "Most recent first," you should see no changes at all. The majority of you already do that. To arrange your news feed in this manner, go to Facebook.com, then at the top of the news items, click on "Sort" and select "Most recent." 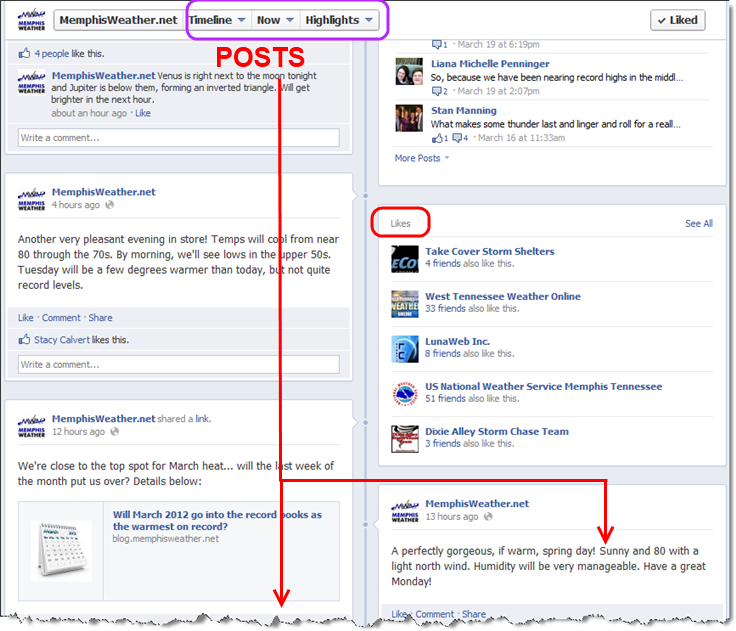 This is the best way to see our posts during severe weather in chronological order (see Figure D below). Finally, I'll make a plug for Twitter. If you are not on Twitter, consider it. Twitter is absolutely the BEST way to follow our severe weather nowcasting. It's always chronological, it's concise, links are provided in posts (tweets), and it's a rapid way of keeping up to date with what's going on. 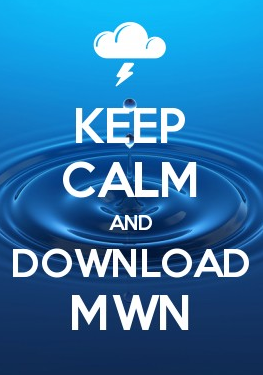 You can also mobile follow MWN, which means our tweets will go straight to your phone as text messages, which can be very handy if you are taking cover from a storm! You can turn on/off the mobile feature at will. 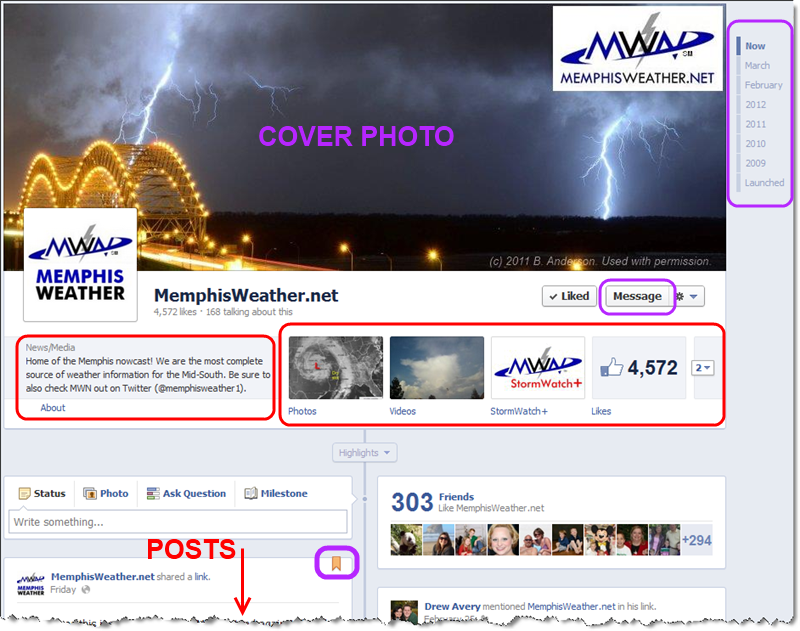 You'll find us on Twitter as 'memphisweather1', or @memphisweather1. The other option for following our Twitter stream is to click on the "Twitter feed" app under the cover photo, as shown below. You can bring this app up and it will auto-refresh as tweets are sent. 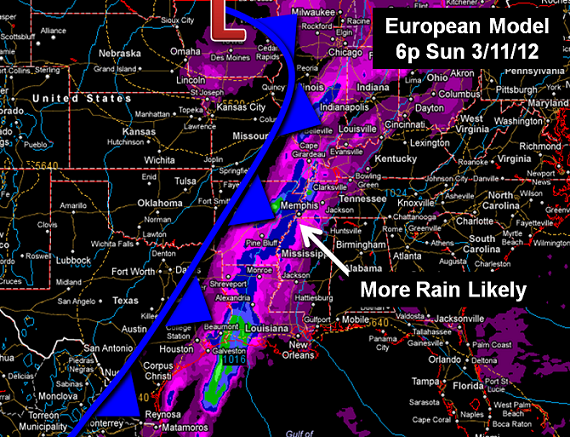 It's also a good way to follow our nowcasting service if you don't wish to join Twitter. Figure E. Click Twitter Feed to see our latest tweets from within Facebook. Hopefully you'll get used to the new Timeline format quickly. While it was certainly not our idea and it will take some adjusting to, Facebook is free to use, so I guess we are at their mercy! If you have any other Facebook suggestions for us, feel free to leave a comment below! We'll try and make this as painless as possible for you! 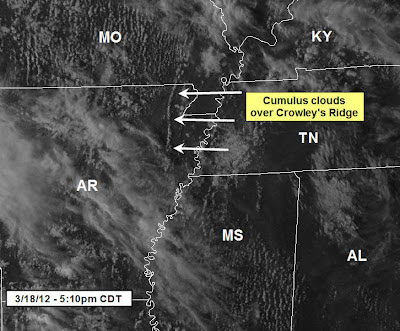 Topography influences the weather - but in the Mid-South? It is fairly well known that topography, such as mountain ranges, has significant effect on weather patterns. For example, air flowing up the Front Range of the Rocky Mountains lifts and condenses and can bring feet of snow to places like Denver, CO. It's what is called an "orographic influence" on the weather. Closer to home, it's also widely-known that the Ozark Mountains, though not to the scale of the Rockies, also can have an effect on the local and downwind weather. But did you know that very small topographical features can also have an effect on the weather? I'm not talking about the bluffs protecting Memphis from tornadoes - that is a weather myth that never seems to die. 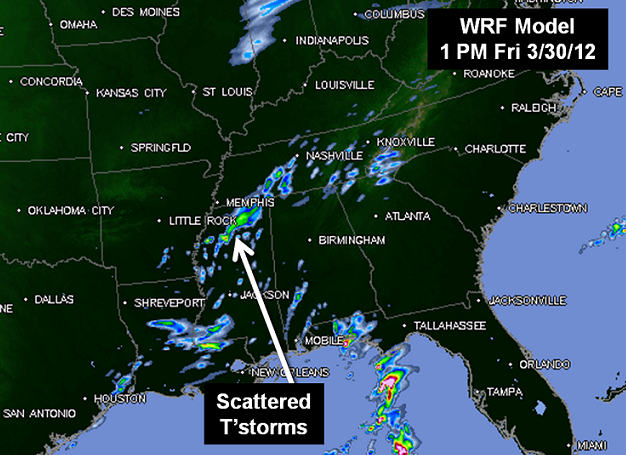 However, there is a topographical feature in the Mid-South that had an effect on the weather just this afternoon! 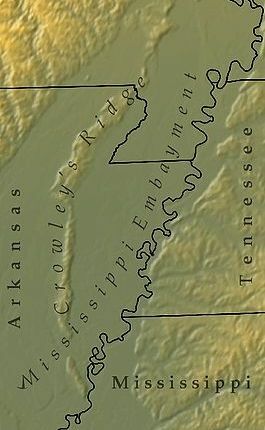 Crowley's Ridge, an elevated area (like a series of narrow hills really) that runs north-south through eastern Arkansas, is about 300-500' higher than the surrounding Mississippi River Delta, or Embayment (see image to right). It's clearly visible on topographic maps, sticking up like a crooked spine in the middle of east AR. On days with warm, humid air in place and general instability (i.e., rising air) in the atmosphere (like many Mid-South summer days), sometimes all it takes is a little extra "oomph" to create showers and thunderstorms, absent a frontal system or upper-level impulse. Thanks to the early summerlike weather we have been experiencing, today was one such day! 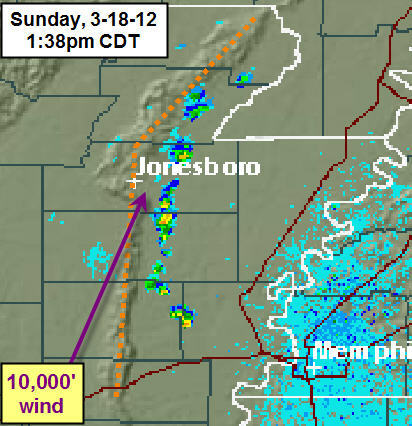 Take a look at the radar image of east AR early this afternoon, shown below. The topography is underlaid on the radar data and Crowley's Ridge is indicated by the dotted orange line. What do you know? Showers formed along Crowley's Ridge! If you were to look at a loop of the radar data, you would see them form over the crest of the ridge, then move north-northeast in the direction of the winds at 10,000 feet, which is why it rained downwind of the ridge! That extra 400' or so of "lift" created by the ridge induced small showers to form! In fact, later this afternoon, cumulus clouds had formed once again right down the spine of the ridge (see second image below). 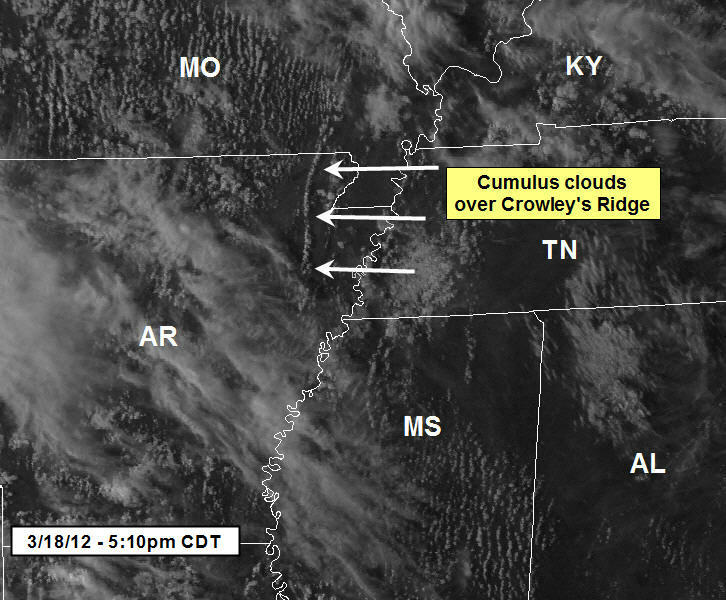 Cumulus clouds, caused by warm temperatures, sufficient moisture, and a little "lift" from Crowley's Ridge, are visible in this satellite image over east AR. Bottom line: it doesn't take a mountain to have an orographic influence on the weather, and it can happen in our own backyard! Have you experienced weather phenomena that might have been influenced by the lay of the land below? 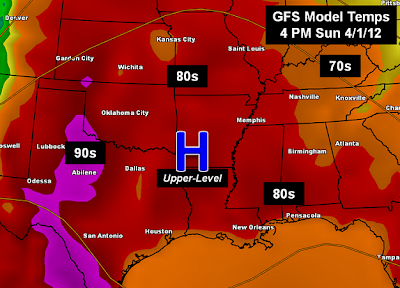 Its technically not even spring yet, but the Mid-South has transitioned into a weather pattern more reminiscent of early summer over the last week, with very warm - even record breaking – temperatures and scattered afternoon “pop-up” thunderstorms. As we begin a new week, the near-record temperatures look to stay a bit longer, but a new system to the west will be bringing our next significant rain chance as well as a break in the streak of early-summer weather. Near to record breaking temperatures look to continue at least Monday and Tuesday, as strong high pressure at the surface and aloft remains in control, which will help keep conditions dry as well. 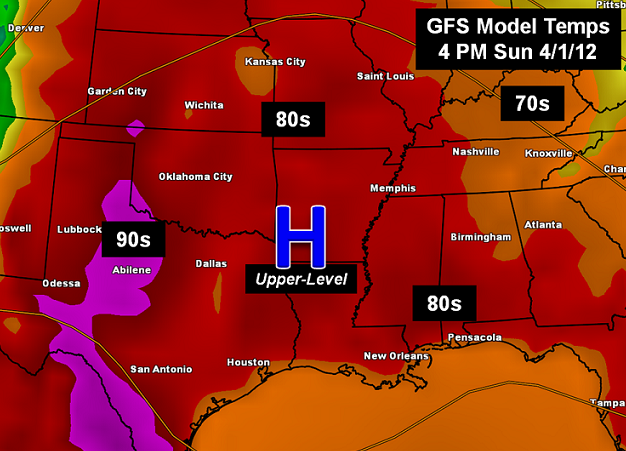 Highs will reach the low to mid 80s, a solid 15 to 20 degrees above normal. Meanwhile, a strong upper level low pressure area developing across the Southern Plains states will meander in much of the same area most of the week. As the interaction between the high and low pressure areas increases on Tuesday, windy conditions will develop over the region, with gusts to 40 mph possible. With the upper level low moving so little, it will take until at least Wednesday before rain chances start increasing in our area. In fact, the latest computer models now suggest that most of the rainfall will hold off until Thursday afternoon and especially Thursday night as a surface cold front slowly advances east ahead of the upper low. 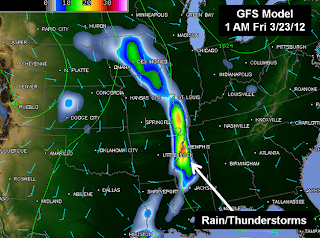 An area of rain with some thunderstorms will move across as it passes, perhaps persisting into part of Friday. So far, it appears that atmospheric conditions will not be favorable for widespread severe weather in the metro area, but some stronger thunderstorms and heavy rainfall amounts could still occur. 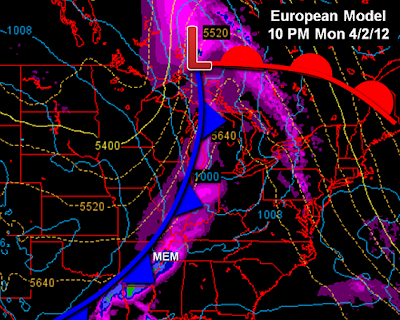 More clarity on any severe weather threat will be available in the next few days. Once this system passes, it will help to break the string of 80-degree weather, sending high temperatures back closer to 70, much closer to the average, with dry conditions likely returning for most of the weekend and into early next week. 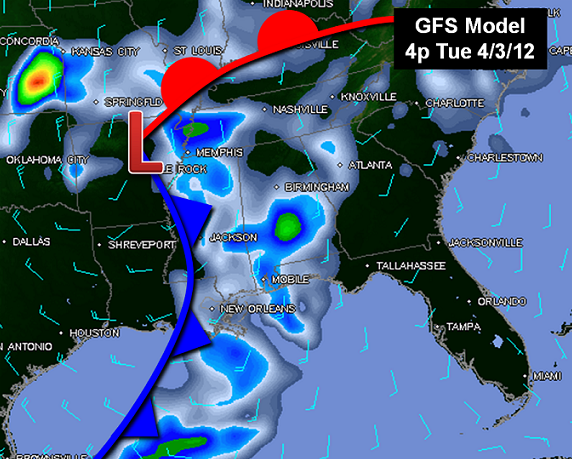 Stay with MemphisWeather.Net throughout the week for up-to-date information on the rain and thunderstorms arriving later in the week, as well as the upcoming record warm temperatures. As of 8pm, SPC has greatly reduced the slight risk area to where ongoing strong to severe thunderstorms are located, specifically part of Louisiana into the Ark-La-Miss region. While general t'storm activity is possible in the metro overnight, it'll be more of the type that makes for good sleeping weather than anything else! As indicated below in our initial post, the initial severe threat was minimal to begin with and we're glad to see the slight risk cut way back. The Storm Prediction Center has placed much of the metro - specifically those counties bordering the Mississippi River - in a slight risk for possible severe weather later today. Though the atmospheric variables are marginal for severe weather in the immediate area, they are more potent over the southern half of the slight risk area, or along and south of I-40/30 in AR (southern AR, LA, and far eastern TX). The main threat for the metro appears to be damaging wind from a potential squall line or mini-lines embedded within a large area of rain. The highest potential for storms will be during the evening hours, between 6pm and midnight. However, one of the key ingredients for severe weather, instability in the atmosphere (which can be aided greatly by sunshine in advance of storms), is lacking, contributing to the lower confidence in severe weather locally. Probability of 58+ mph wind with today's storms, as issued by SPC. MWN meteorologists feel that while the risk of severe weather is low, some storms could produce strong wind gusts and certainly dangerous lightning. You can stay on top of severe weather, and be notified if it threatens your specific location, by downloading the MemphisWeather.net app with StormWatch+ for your Android smartphone or tablet or iOS devices (iPhone, iPad, etc.). A link to more information on the apps is below. MWN plans to nowcast during any stormy weather tonight via Facebook and Twitter (links below). 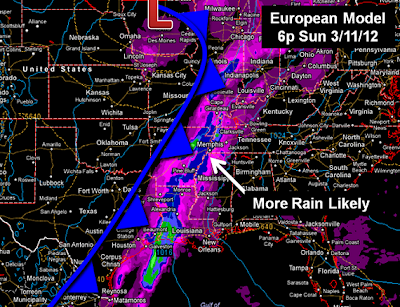 A strong cold front passed through the Memphis metropolitan area during the early afternoon hours. It was accompanied by strong wind, drastically cooler temperatures, and abundant rainfall. 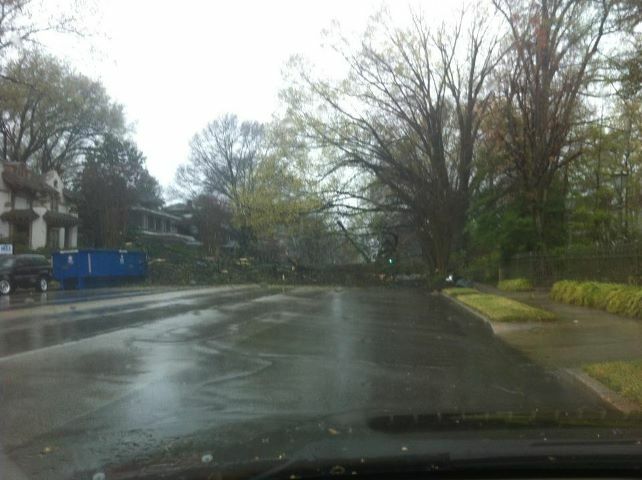 Some minor damage occurred in the city (Midtown) as trees fell and power outages topped out near 3000 customers. 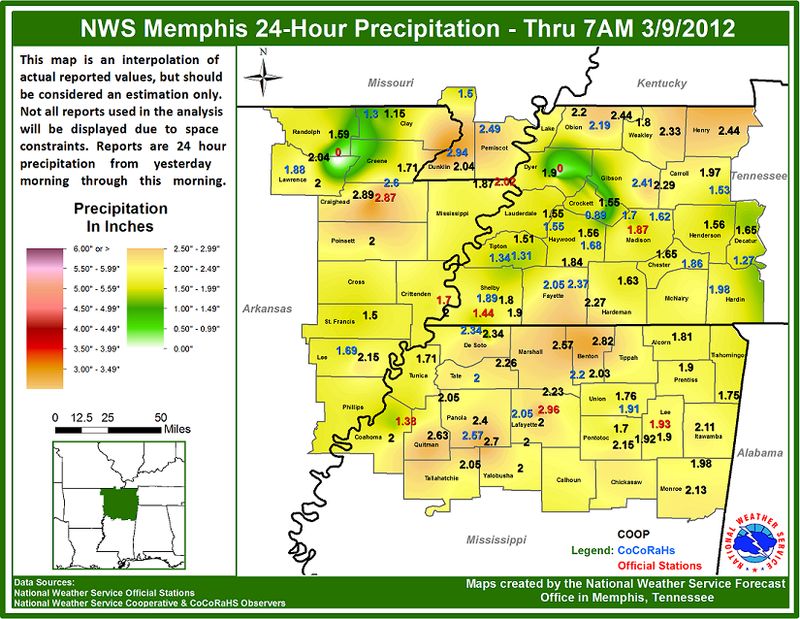 Rainfall totals across the region were generally in the 1.5"-3.0" range. 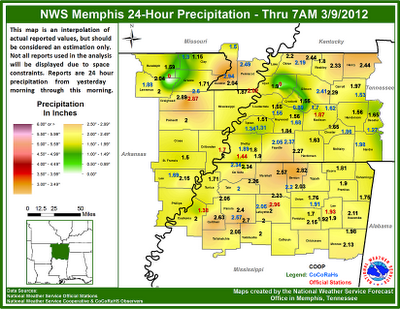 MWN in Bartlett officially recorded 1.59" of rain while Memphis International ended up with 1.44". Rain was continuous behind the front, lasting approximately 10-12 hours. Behind the initial line of storms, strong northerly wind ushered in MUCH cooler temperatures. After starting the morning in the 60s and rising to the lower 70s shortly after noon, the arrival of the cold front brought an immediate freefall of about 20 degrees, followed by another 10 degree drop over the next couple of hours. Temps then held steady near 40 throughout the overnight hours. 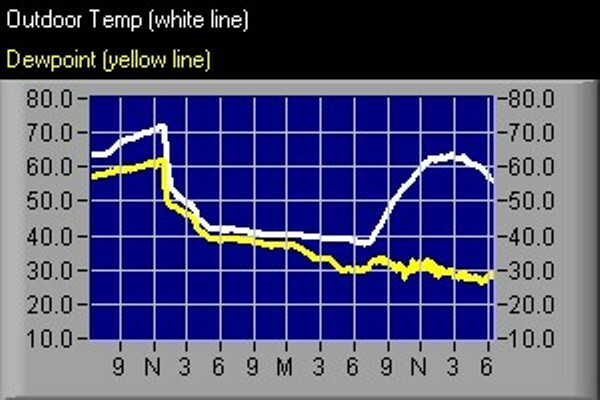 Temperature/dewpoint plot from MWN in Bartlett beginning at 6am Thursday. Note the drastic drop as the cold front passed through around 1pm. Temps dropped 30 degrees in about 3 hours. Further south over north MS, where a slight risk of severe weather was expected, storms brought strong straight-line wind of up to 100 mph (equivalent of an EF-1 tornado on the Enhanced Fujita scale) in 3 locations in Yalobusha and Tallahatchie Counties. There were4 injuries and mobile homes damaged in all 3 locations. Summaries of the damage appear below. ROOF. WINDS AT THIS LOCATION WERE ESTIMATED AT AROUND 100 MPH. WERE A FEW SNAPPED PINE TREES AS WELL. ROAD. SEVERAL TREES WERE SNAPPED AND UPROOTED. 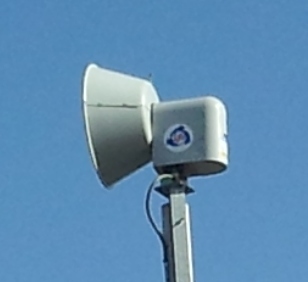 In part 1 of this MWN Blog series on outdoor warning sirens, we examined the role of the Memphis/Shelby County Emergency Management Agency (MSCEMA) with respect to severe weather, specifically the process by which outdoor sirens are sounded. In it, you learned that the EMA is responsible for sounding all sirens in Shelby County except those in Bartlett, Collierville, and Germantown, who activate their own sirens. In part 2, we will focus on the purpose of the sirens, what they are intended to do, and more importantly, what they are NOT intended to do. To recap, outdoor warning sirens are sounded continuously countywide whenever any portion of the county is included in a Tornado Warning issued by the National Weather Service (NWS). These outdoor warning sirens are NOT referred to strictly as tornado sirens for a reason: it is not fully descriptive of the mission they serve. From the MSCEMA website (http://www.mscema.org - emphasis added): "[Outdoor warning] sirens are designed to be an early warning device primarily for persons who are outside away from the television and/or radio." As stated above and repeated many times by MemphisWeather.net, these are OUTDOOR sirens. They can be extremely useful if one is working or recreating outside and severe weather threatens. When sirens sound, you should seek out additional information on the threat. This can be done in a number of ways, but the most common are to tune into local radio or television, check local weather websites or properly-equipped smartphone apps, and/or turn on NOAA Weather Radio (which should have also sounded an alarm when the sirens sounded). If none of these additional information sources is available, you should take adequate cover until the sirens cease. Sirens are NOT designed to A) wake you up at night, especially if storms are in progress with wind and rain creating additional noise or you are a heavy sleeper; B) alert you if you are indoors, especially in newer, more energy-efficient, and better-insulated homes with additional electronic noise (like air conditioners running, music playing, or television on); or C) reach every square mile of the county. In fact, even outside, environmental factors such as the direction and speed of the wind, relative humidity, and air stability can affect where sirens are heard on any given day. The bottom line is this: sirens are designed to alert those outdoors to the threat of severe weather and encourage them to seek additional information. Do NOT call local authorities, including the EMA, if you aren't woken up by a siren or you didn't hear it inside, UNLESS you are fairly certain that a nearby siren that you have heard under those circumstances before is not operating properly (i.e., fails to sound). Click here for a list of all sirens and the person to contact in case of siren failure ONLY. In the third installment of this series, we will examine the future of warning technology - from sirens to smartphone apps - in an age of polygon warnings. Recently I had the honor and pleasure of sitting down with several individuals from the Memphis/Shelby County Emergency Management Agency (MSCEMA), including Mr. Bob Nations, Director; Mr. Levell Blanchard, Deputy Director; Mr. Tommy Thompson, Outdoor Warning Siren Coordinator; and Mr. Keith Butler, Dispatcher and "technical guy" for the EMA's many electronics and communications systems. I also was fortunate to tour the EMA's Emergency Operations Center in Midtown. The purpose of the meeting was to discuss the outdoor warning siren system in Shelby County, learn more about how their systems and processes work during severe weather, and perhaps find out if any changes to the warning process were in the works. I came away impressed with both the responsibility and recent accomplishments of the EMA personnel. This is the first in a 3-part blog series on the outdoor warning sirens in Shelby County. 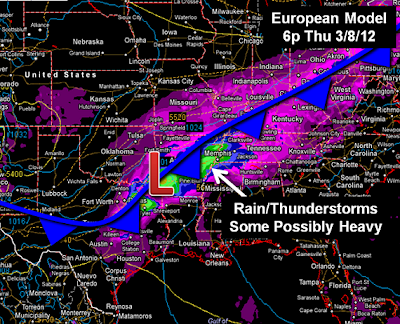 This first entry examines the role of the EMA during severe weather, including the sounding of the sirens. The second installment will focus on the intent of outdoor warning sirens, what they are designed to do, and NOT to do. The answers may surprise you. We'll conclude with a look at the future of warning technology, including sirens, in part 3. 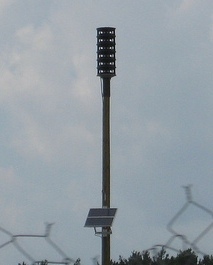 One of the most visible (or audible perhaps) roles of the EMA is the sounding of outdoor warning sirens. I've discussed the policy of sounding the sirens previously on this blog, but the bottom line is this: currently, all sirens in Shelby County sound continuously throughout the duration of a Tornado Warning if any part of Shelby County is included in a National Weather Service-issued Tornado Warning. That means if Millington is under a tornado warning, Collierville's sirens sound (more on how this works below). 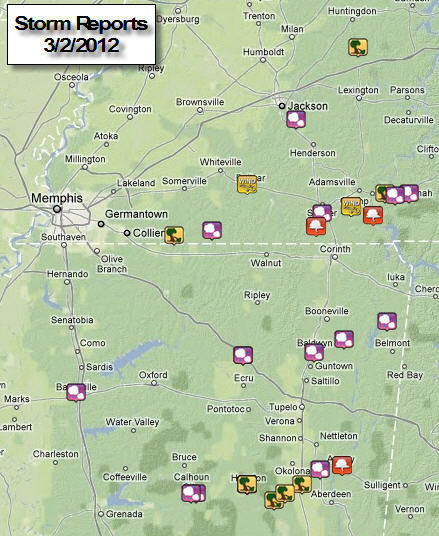 Click here for a map of siren locations in Shelby County or click here for a list of all sirens.. Though the siren system was originally designed to warn the public of air raids during World War II, then nuclear fallout during the Cold War, the practice of using sirens to warn of severe weather dates back decades, well before the NWS began issuing polygon warnings that didn't encompass entire counties. 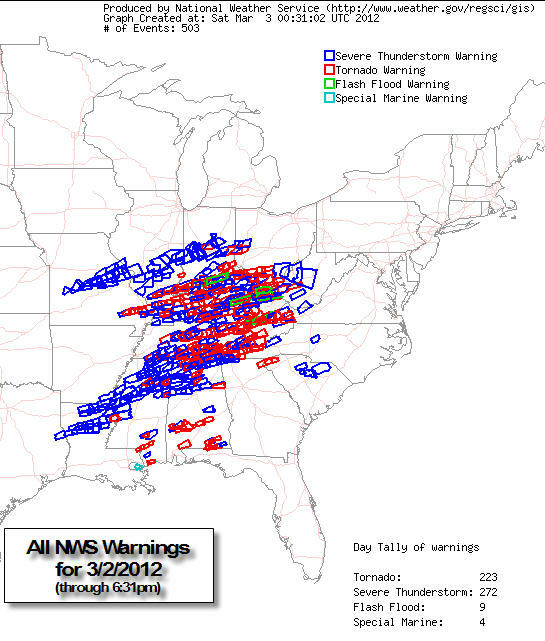 That NWS policy change occurred in 2007. The EMA Emergency Operations Center (EOC) is staffed by dispatchers around-the-clock, handling all sorts of calls for emergency response. Their busiest period is typically during severe weather. In the EOC, a computer running weather messaging software is constantly ingesting bulletins from the Memphis NWS office via satellite (with internet backup) and processing them for any watches and warnings. (Backup systems are also in place in case of a failure of the primary computer, including Weather Radio, statewide emergency communications, and local broadcast television.) In the event of a watch or warning, a pop-up on the dispatcher's terminal immediately displays the text of the alert. If the alert received by the dispatcher is a Tornado Warning for any part of Shelby County, the dispatcher will then activate the sirens throughout Shelby County - except Bartlett, Collierville, and Germantown - using two different systems. The three municipalities named are responsible for activation of the sirens in their own jurisdictions. Telephone calls are placed from EMA to dispatchers in each of these three suburban cities to make them aware of the warning. Bartlett, Collierville, and Germantown will typically also sound their sirens based on the information they receive. The sirens sound countywide until the expiration time of the warning or the cancellation of it, should the NWS cancel the warning prior to the original expiration time. All of Shelby County must be clear of any Tornado Warnings before the sirens will be shut off. Stay with us later this week as we examine the use of outdoor sirens in part 2 of this 3-part blog series. Warm winter temperatures continued into February, though not as much above average as January. Precipitation was below average for the second straight month. According to the National Weather Service, the meteorological winter recording period of December-February ended up as the 7th warmest on record at Memphis International Airport. The average temperature of 47.1 degrees was 4.1 degrees above normal. There was not a single day in which the temperature did not rise above freezing. Total snowfall for the winter was 1.3" (2.3" below normal) and total precipitation was 13.31", or 0.79" below the long-term average of 14.10". The average temperature for the month of February was 49.0 degrees, 3.5 degrees above normal. The average high temperature was 57.3 degrees and the average low was 40.6. The coolest temperature of the month was 22 degrees on the 12th, while the highest temperature was 79 degrees set on the 23rd. There were only 5 days in which the low temperature dropped to, or below, freezing (32 F). Conversely, there were 11 days in which the high reached 60 degrees or better and 4 days in the last week of the month which saw a high of over 70 degrees was recorded..
Precipitation for the month totaled 3.03", which was 1.36" below average. There were 14 days with measurable rainfall but only two of those days had 0.50" or more. 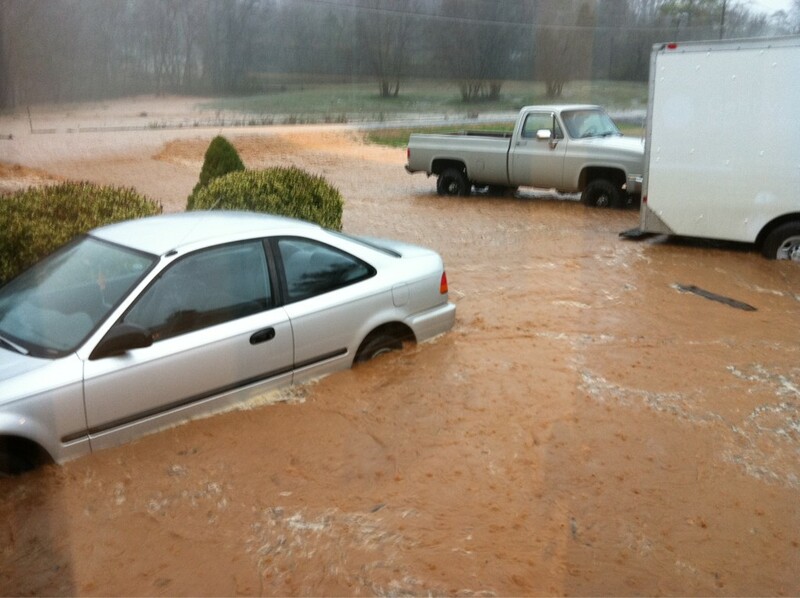 The maximum 24-hour amount was 1.02" on the 3rd-4th. There were traces of snowfall recorded on the 10th and 11th and a trace of snow & sleet on the13th. The peak wind gust was 32 mph (from the southwest) on the 23rd with an average wind speed for the month of 8.3 mph. Click here for a daily statistical recap for Memphis International Airport. The average February temperature at Cirrus Weather Solutions in north Bartlett was 48.1 degrees with a maximum of 79.2 degrees on the 23rd and a minimum of 19.9 degrees on the 13th. February precipitation totaled 3.03" in the automated gauge. A co-located manual gauge used for the CoCoRaHS program measured 3.05". There were traces of snowfall recorded on the 10th and 11th and a trace of snow & sleet on the13th. The peak wind gust was 37 mph during the early morning hours of the 29th. Average relative humidity was 66%. Click here for a daily recap on MemphisWeather.net. For the month of February, the average temperature error in all MWN temperature forecasts was 2.54 degrees. 64% of the MWN temperature forecasts for the month were within 2 degrees of the actual temperature. MWN's forecasts extend out five periods (or 2.5 days). For dewpoint accuracy, the MWN forecast averaged 3.61 degrees of error and fell within 2 degrees of the actual dewpoint 46% of the time. Historical accuracy statistics can be found here. After a nearly perfect afternoon across the area today, it’s hard to want to look ahead to the next system that brings the risk of thunderstorms and severe weather, but with its arrival less than 24 hours away, that’s what we must do! We first detailed the severe weather threat with this system in a blog post last night, and looking again today it appears a bit clearer, and for us in the metro, that may mean good news. As mentioned last night, there are two distinct periods of interest. The first arrives late tonight, primarily after midnight to near dawn, as a warm front to our south begins to surge northward through the area. With its passing, showers and a few thunderstorms may break out near it. Unfortunately, models are still not in great agreement on just how much coverage of rain and thunder may occur, so confidence is not particularly high for this portion. Should development take place in the metro area, the increasing instability associated with the warm front’s passage could promote the development of a few stronger “elevated” thunderstorms with the possibility of hail. 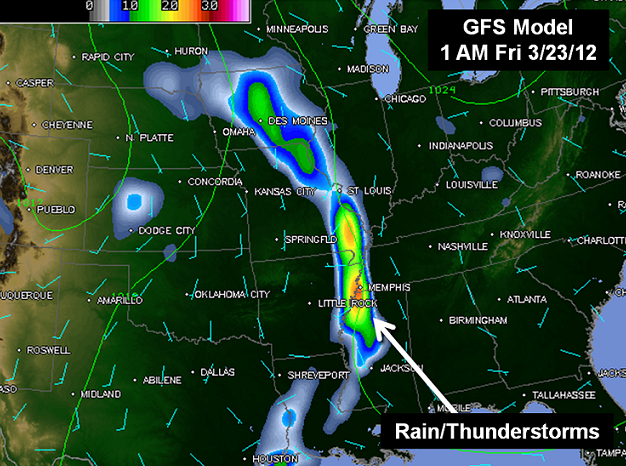 Better chances for this activity will likely exist to our northwest, over northeast Arkansas and southeast Missouri. However, don't be surprised if thunder wakes you up early tomorrow morning! Once the warm front has cleared the area, the atmosphere over the Mid-South will become “capped” to additional thunderstorms Friday morning, similar to what occurred Wednesday. Some sun may break out and temperatures will become quite warm, rising into the 70s with gusty southwest winds. All of these factors will lead to building instability values, as the primary storm system and associated cold front approach from the west. Sometime during the afternoon, the “cap” will break and numerous thunderstorms will develop in advance of the front, with some quite likely to be severe. However, the big question that remains for those of us here in the metro is just how soon thunderstorms develop. Models are in better agreement for this round of weather, and fortunately for us they are leaning heavily toward the idea that development will primarily occur east of the city of Memphis, and perhaps entirely east of the metro area. In a conference call with NWS partners this afternoon, including MWN, NWS-Memphis agreed with this idea (see graphic below), and so do we. That said, there still remains some risk that thunderstorms develop early and far enough west to impact this area, especially those just east of Memphis itself. One possible scenario is that thunderstorms begin their development right over the metro, but don’t begin to mature and become severe until they move just east. 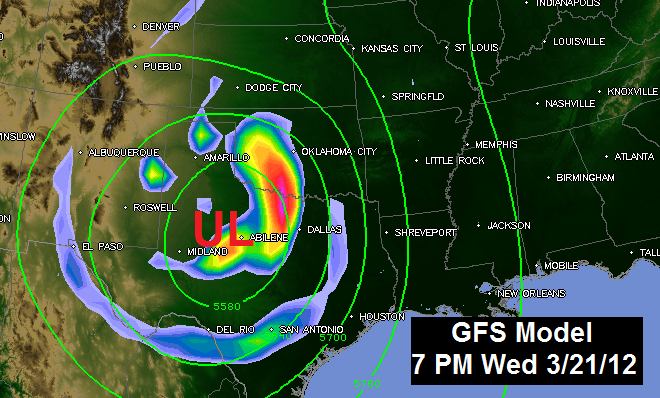 It’s likely to be a close call, so we encourage everyone in the metro to remain weather-aware with this one. The atmospheric parameters in place for this event favor all modes of severe weather, including a threat for tornadoes. In fact, those parameters will almost certainly come together north and east of us, where the Storm Prediction Center has already highlighted a “Moderate Risk” for severe weather (see graphic). It will be these areas likely to be in the thick of a significant severe thunderstorm and tornado outbreak tomorrow. If you have interests in these areas, please make sure they are keeping up with the weather. Back here in the metro, once the cold front clears, much cooler temperatures will be filtering into the area. Readings nearing 40 are likely by the time you wake up Saturday, and that will lead into a fantastic weekend overall, though certainly cooler than the past several days! A much calmer pattern is also looking to continue for much of next week as well. Continue to stay with MWN through the night and into Friday for the very latest on this system. If necessary, we’ll be providing nowcasting of any thunderstorms moving through the metro area via social media. Also, don’t forget our StormWatch+ service that will immediately notify you on your smartphone to any severe weather alerts issued, even if you are asleep! 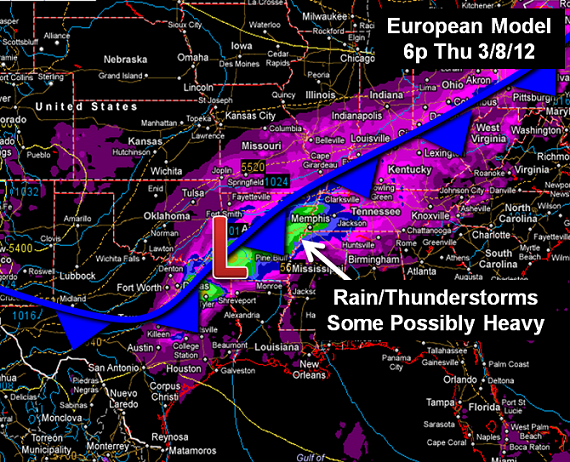 For more, visit StormWatchPlus.com.